Precision-ground to a flatness tolerance of 0.005 inch (0.1 mm) over the entire surface, this honing plate is an excellent substrate for diamond paste. Made of dimensionally stable low-carbon steel, it will retain its flatness over a lifetime of ordinary use; unlike sharpening stones, it will never need truing. Plates can be glued to a backing board for ease of handling and storage. Similar in size to a regular water stone, each measures 8 inch x 3 inch x 3/8 inch (203 x 76 x 9.5 mm) and weighs just under 2-1/2 lb (1130 g). Sold individually. Made in Canada. 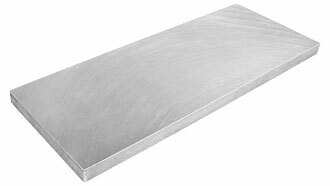 This lapping plate made of steel is made to flatten chisels, plane blades and the body of cast iron planes. This plate has grooves to take the slurry. Not intended for heavy material removal, it is designed to condition or smooth previously ground surfaces and is used with light mineral or honing oil and silicon carbide powder. for flattening water stones, as the oil lubricant will ruin the water stone. with water as a lubricant, as water will rust the lap. for flattening oil stones, as any residual grit on the lap can be transferred to the stone, resulting in scratches during honing. as a replacement for a honing stone, as the grooves are unsuitable for a honing guide and the blade bevel can be seriously damaged. This is the most versatile and useful flattening and sharpening block available on the market today. It is two-side: the side with the deep grooves (top photo) is for flattening sharpening stones, and the side with small perforations is designed to flatten the backs of plane irons, chisels and similar tools. A part of this side (70 x 48 mm) is unperforated, so that one can also work very small tools, because they might hang up or tip in the perforated section. This Shapton Diamond-Flattening block is the only one designed to work on both stones and also for planes, chisels and other blades. The monocristalline diamond chips are bedded in a coating of nickel on the surface of the plate. The body of the flattening plate is made of a hard alloy of cast bronze. The grit size is the same on both sides of the plate, and is somewhere between a 270 and a 325 grit, but it should be noted that diamond grit cuts better and faster than the equivalent grit size on conventional waterstones. The two-part heavy rubber box serves both as a slip-proof base for the plate in use, and can also be used as a holder for any other waterstone. The plate should only be used with water! The plate should only be used with water!